Two Alabamians who impacted the state through their leadership in religion and education were inducted into the Alabama Men’s Hall of Fame Tuesday, Sept. 23. The late Norman Henry “John” McCrummen II and the late Clare Purcell were cited for their influence in the state, the nation and the world during the induction ceremony and luncheon hosted by the Women’s Committee of 100 for Birmingham. Nominees for the Men’s Hall of Fame, which is housed at Samford University, must have been deceased for at least two years. McCrummen was a pastor of Alabama Baptist churches in Atmore and Selma and at Woodlawn Baptist Church in Birmingham before beginning a 20-year tenure as president of Judson College in Marion, Ala., in 1970. He died in 2002. Purcell served Methodist churches throughout Alabama before being named a bishop of the church in 1938. He was elected to the denomination’s highest national post as president of the Council of Bishops in 1955. He died in 1964. McCrummen was committed to the mission of Christian higher education, especially for young women, said David Potts, who succeeded the honoree as president of the Baptist-affiliated women’s college. “He ever sought to point his students to God and His purpose, encouraging young women to take the road less traveled, the more narrow but ever so more fulfilling way,” said Potts. Speaking for the family, Norman McCrummen III noted that his father, who was known in public as the epitome of a gentleman, was the same at home with his wife Kitty and their three children, including daughter Lynn McCrummen Johnson and another son, the late Warren McCrummen. 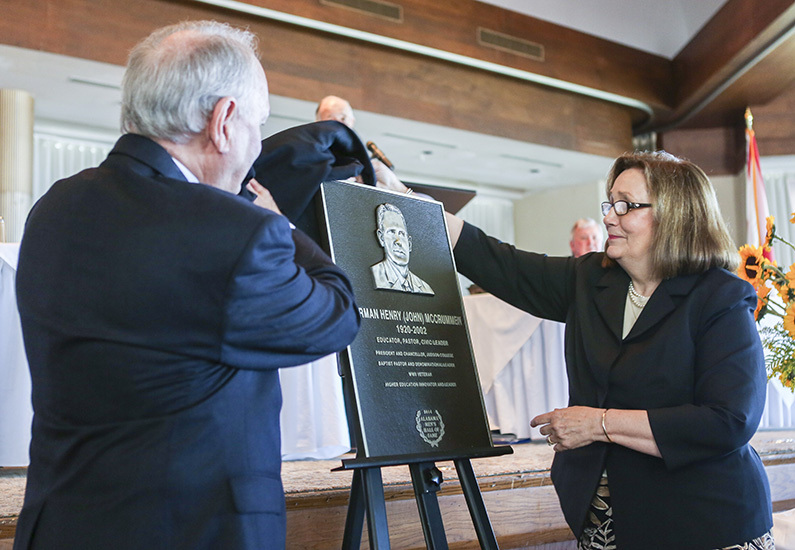 “We grew up knowing that he believed that in order to show love and gratitude to God, you must show the same to one’s neighbor,” said McCrummen, who with his sister unveiled the plaque that will hang in Samford’s Harwell G. Davis Library. Purcell, noted his grandson and namesake Douglas Clare Purcell, lived by the scripture that reads “Be ye doers of the word, and not hearers only.” The verse was inscribed on a Bible the younger Purcell received from his grandparents at age three. “No other Bible verse could more accurately reflect his intentions as he went about his far reaching ministry to people and places he served during almost six decades of devoted and selfless work,” said Purcell. In the 1930s, the honoree helped facilitate the union of the Methodist Episcopal Church South, the Methodist Episcopal Church and the Methodist Protestant Church. The action helped to heal an historic breach and bring the groups together. He was an inspiring speaker, accomplished scholar, prolific contributor to church periodicals and a dedicated humanitarian whose counsel on matters related to the improvement of life and social programs was solicited by U.S. presidents Franklin Roosevelt and Harry Truman, said Purcell. “Bishop Purcell lived humbly and with dignity and recognized the value of all people. He held respect and compassion for all people,” Purcell said. Two other Purcell grandchildren, Martha Smith and Ethel Morris-Caffee, unveiled his plaque. Jeanna Westmoreland, president of the Women’s Committee of 100 for Birmingham, presided at the induction luncheon at The Club in Birmingham. Alabama Men’s Hall of Fame chair Hugh Maddox introduced the presenters. Hall of Fame board member Elouise Williams cited Samford’s Orlean Bullard Beeson School of Education for its partnership in a unique youth education program aimed at fourth graders. Lesson plans highlighting Hall of Fame honorees are created by Samford education students for use in elementary schools statewide. The lessons help to inform future generations about the accomplishments of outstanding Alabama men, Williams said.